So as you can see I am giving away a few of my The Awakened paperbacks to try and get more people involved in that setting. I am still trying to get an update on the hardcovers-if you want an update email Neal at darkquestgames@gmail.com, the more people who inquire the quicker we get a status update. Book II is sent to the publisher and I am expecting a cover to be done by the end of May. I just sent out two contracts about covers for books III and IV!! Freelance work is here, just trying to get some clarifications on what to do, we are in an odd spot where we were asked to do work but the template has not been created so we offered a template idea and now waiting to see what happens, usually you get asked for a job and it is given specifically to you or you pitch a job and already have the basics laid out, this was a mish mosh, not unhappy with it, just interesting. 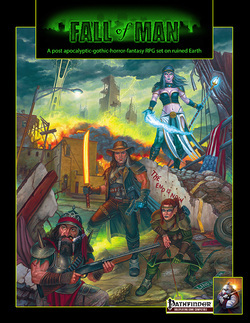 We are getting a few books converted to Pathfinder including Fall of Man, the project lives, more information to come in May, but PA fans, Pathfinder fans and fans of our previous work will not be disappointed!! So I am keeping real busy including some work on a starter project that I hope comes to fruition, it will be a slow but wonderful thing if we can get it off the ground.